After a long day at work or school we want a break from the real world. That is why we have Movies, TV Shows and Video Games to take us away from the routine of daily life. 7e Digital provides In-home setup of all your home theater components. 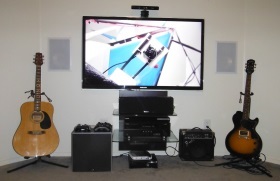 7e Digital LLC is located in Tucson, AZ and is ready to Setup and upgrade your home theater system and gaming systems. Schedule an on-site appointment online or give us a call at (520) 393-9299. You got a new TV or home theater device and you're not sure how to hook it up? Our team is educated in the latest home A&V technology standards, which allows them to setup your home theater system to look and sound its best. Would you like to mount your LCD, LED or Plasma TV to your wall, but you daydream about your $1,000 TV falling of the wall? Let one of our experienced techs wall mount your TV and you can feel confident your TV will stay put. We harness the power of the Logitech Harmony universal remote line of products to make your home theater system work with one remote. With a single click of the Harmony remote your TV will turn on, go to the correct input, your AV reciever will turn on and go to the correct input and your Blu-Ray, cable box or gaming system will turn on. With all this power in your hand you will never need to fuss with multiple remotes again. Do you have hundreds of DVD and Blu-Rays in your collection, and would like to access them like a video on YouTube or a movie on Netflix? Our techs can hook you up with a NAS (Network Attached Storage) server to rip all you movies, music and photos to. Your digital media will then be available to every Smart TV, console, Roku box and you can even access your content anywhere in the world with a personal cloud. We can setup, optimize and troubleshoot any gaming consoles you have. Even if your still rocking an Atari 2600 we have the know-how to get your console experience perfect.